Zoo Atlanta is home to the Black Rhinoceros, which has been hunted to near extinction in its native habitat in Southeastern Africa. Actually, is has already been hunted to extinction in some regions. Zoo Atlanta is working to preserve the species through its conservations efforts. 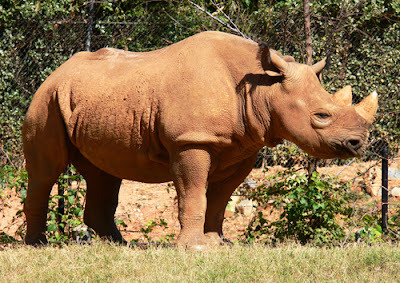 The second largest mammal on Earth (behind only the Elephant), the Rhinoceros is among the most endangered animals on the planet and is currently in "critically endangered" status. It's hunted primarily for its horns, which is believed, by some cultures, that in a powdered form has curative properties and works as an aphrodisiac. There are only five species of Rhinoceros in the world. Three species live in Asia and Zoo Atlanta has one of the two species that live in Africa...which makes seeing this magnificent, endangered creature a unique opportunity.